If you have a die cutting machine and thin dies, check out this YouTube. 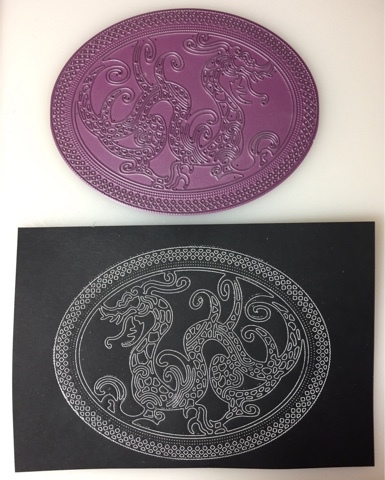 A quick overview is that you carefully ink your die with embossing ink, then run your die with paper through your machine to emboss only (not cut). Instead of being embossed (or raised) the line is embedded in the paper or debossed. After heat (de)embossing you are left with the thinnest line. 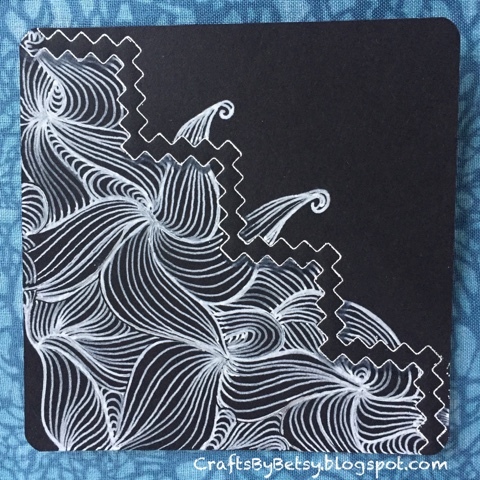 I, of course, felt the need to combine the technique with tangling. So, the Diva challenge this week was Halloween themed, or white on black. Ok. Did I have something scarier in my dies? Not sure if it's Halloween, but I think if I bumped into a dragon I'd definitely have a scare! So, another Cheery Lynn die. Isn't it beautiful? 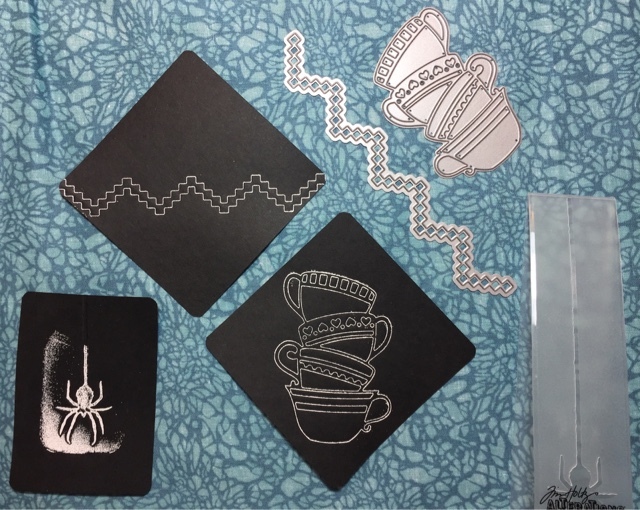 And a few other dies and an embossing folder I thought I'd give a try. The completed dragon after adding Tipple, Yincut and then drawing in lines like I was filling Isochor. I used metallic gelly rolls. This Chevron die (by My Favorite Things) ended up being the foreground for Scena. 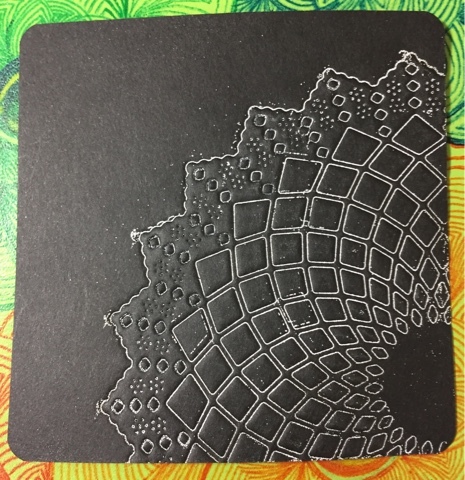 Trying the technique with an actual embossing folder (crazy right?;-). 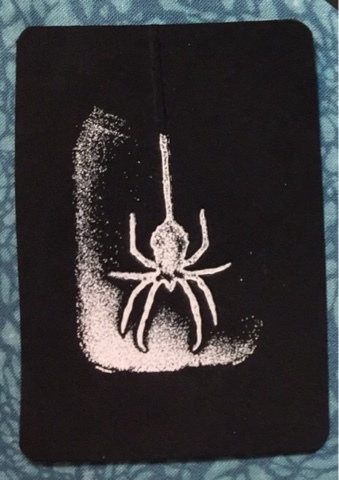 I used this fun Spider by Sizzix. Do you see all that excess embossing powder? Only the spider is debossed. The powder just stuck everywhere else. Some might have viewed it as ruined, or at least attempted to brush away all that powder before heating, but I thought it looked kind of cool and that maybe I could work it into the design. 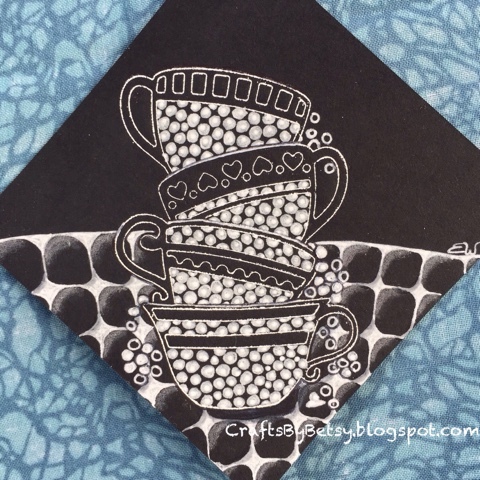 That happy accident turned out to be the best part of my completed ATC don't you think? That's 'NZeppel and Rain gracing the card. I used a combo of white ink, pencil and zenstone in addition to gray Fabrico. Did you catch my NFluxel last week? Just thought I'd ask since I had two posts last week. Such a great idea! Ive never tried a die-cut/embosser machine. Looks like fun! I love them all, but the first is so intricate! All beautiful!!! Love the dragon ons, it's like lace. 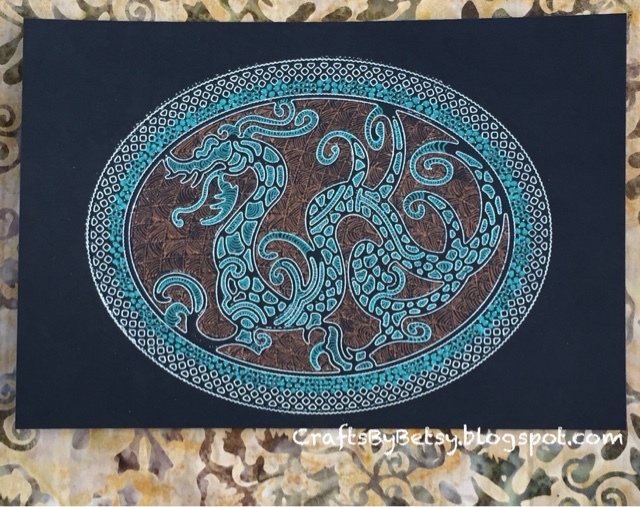 Wonderful, all tiles look great, that embossing powder is fantastic to work on black tiles and your drawing with that dragon, I love that!!! A great selection and I can't wait to try the debossing with dies. Your work is so beautiful! Wonderful black-and-white compositions and great dragon! All are beautiful! Great idea! Especially I like the dragon! 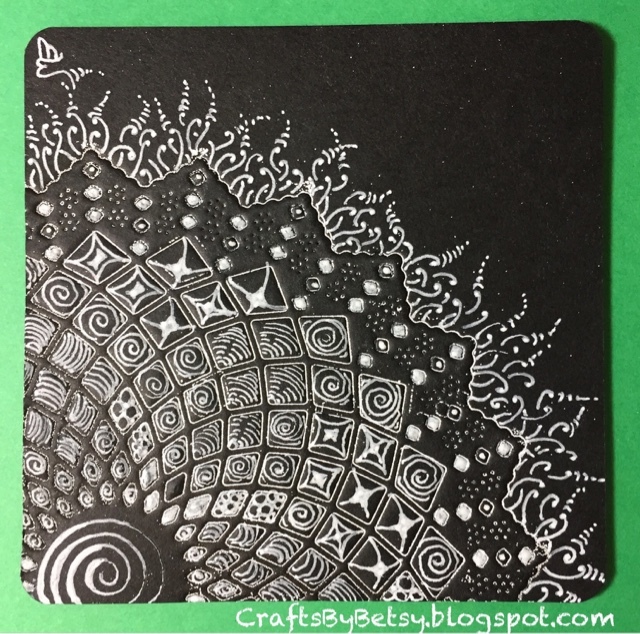 I so enjoy seeing how you mingle your tangling with other media and techniques. 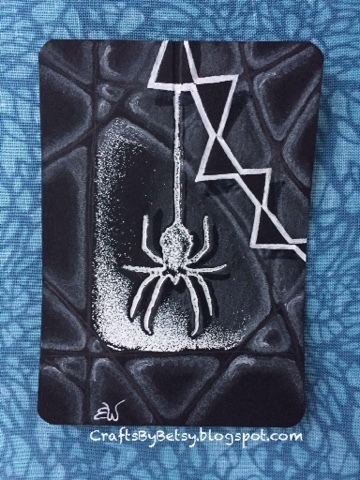 The spider ATC is perfection!